FieldX Irrigation is a module in the FieldX Platform for monitoring soil moisture data and creating irrigation scheduling recommendations. 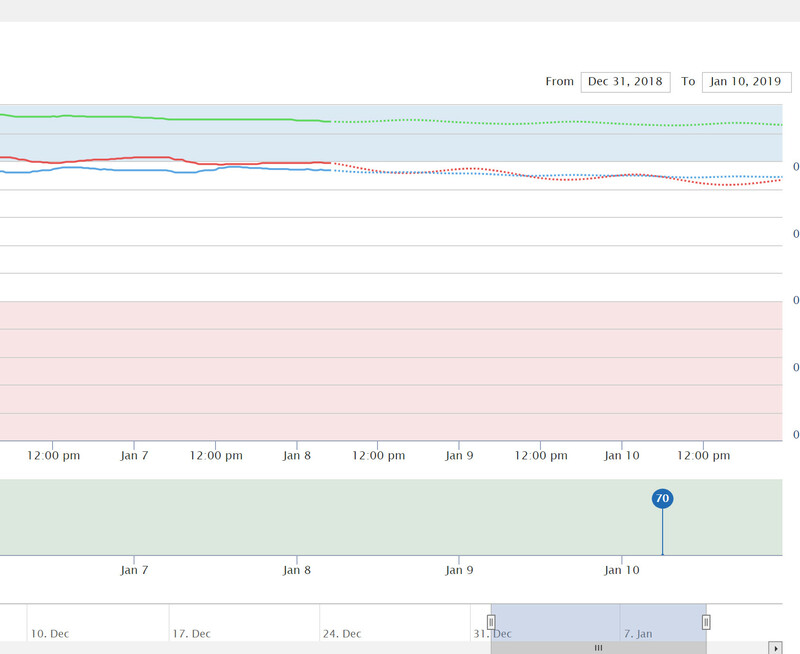 FieldX Irrigation charts the output from supported soil moisture sensors and in-field rain gauges. Soil moisture can be displayed as either Plant Available Water (PAW) or Volumetric Water Content (VWC). Alerts are emailed to uses when a field requires attention. For example, soil moisture alerts are sent for fields that fall below PAW Thresholds, and sensor equipment alerts are sent for ‘Low Battery,’ ‘Missing Data,’ and other issues. Soil moisture levels are predicted for three days using a proprietary adaptive machine learning algorithm, with a unique predictive model being created for each soil moisture sensor in each field. By using this method, the model more accurately reflects the effect of soil type and root growth near each sensor compared to models that rely on generic crop growth models. The predicted soil moisture can then be used as a decision aid in creating irrigation recommendations. 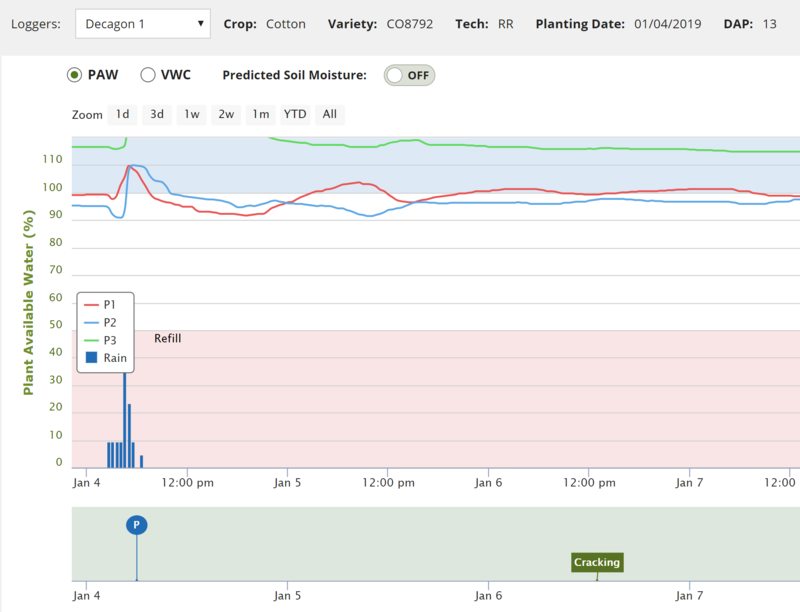 Planting and scouting data entered into the FieldX recordkeeping tools (such as FieldX Office or FieldX Journal) are displayed on the soil moisture chart. With this feature, the crop, variety, technology, days after planting, and growth stage observations stay at your fingertips while reviewing soil moisture data. 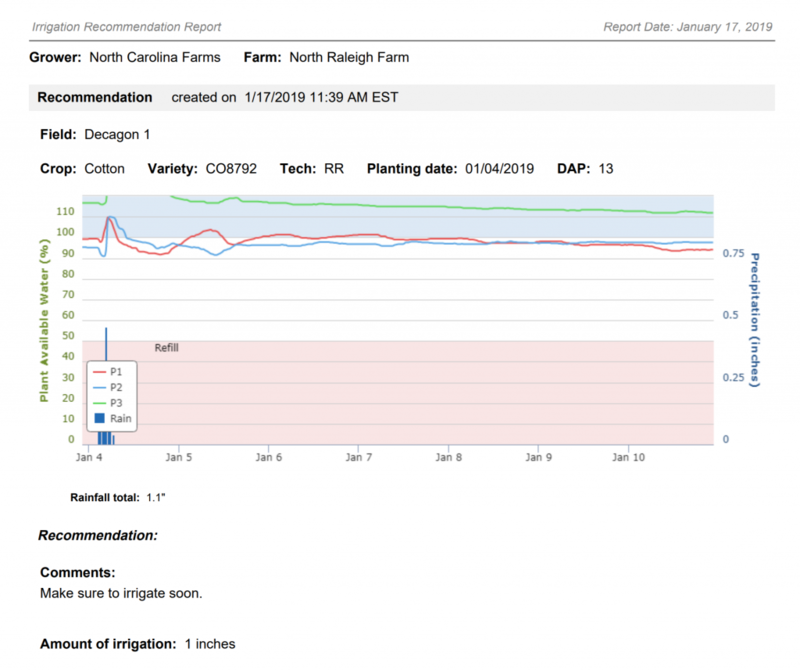 Knowing more about the crop in the field can help you make better informed irrigation recommendations without toggling between multiple software programs. FieldX Irrigation generates professional irrigation recommendation reports. The PDF report includes the Recommendation details and a screenshot of the current soil moisture chart, giving your customers a view of moisture levels in their field with your recommendations. Unlimited free user accounts are available for your customers or managers who need to review soil moisture data, but don’t need to manipulate data or make recommendations. The tables below display the current list of supported loggers and sensors. Then through 2019 and beyond, our team will continue adding other brands of equipment. Let us know which brands you are using and we will add them to the list. Irrigation will be available for free and unlimited use through April 15, 2019. After the introductory period, pricing for FieldX Irrigation will be based on the number of loggers connected and your subscription type.